Reddit Pictures is a free Windows 8 Reddit client that lets you view amazing pictures from Reddit without showing the other stuff. The app has a clean and clutter-free interface to browse and view pictures of all kinds that have been posted on Reddit and are quite popular. You can use this app to view these pictures and kill some time. Apart from simple viewing, you can download, copy, and even share these pictures using the app. 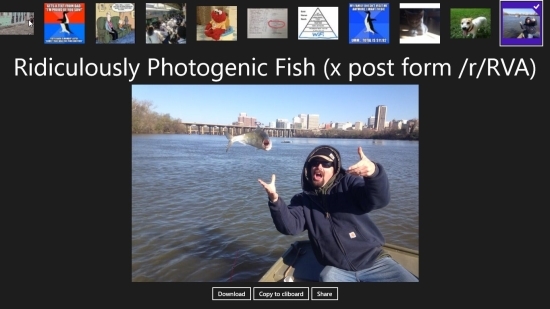 Reddit Pictures is freely available in the Entertainment category of Windows Store. Use Win + Q key combination to search for the app in Windows Store, or view the app directly using the link given at the end of this article. Let’s see how this free Windows 8 Reddit client app works. Reddit Pictures is a simple app and is very easy to use. After installing once you launch the app you will see a blank interface with the app working in background to collect some pictures. After a few seconds you will see a ribbon at the top with a number of pictures appearing in sequence. Clicking on any of them will open its larger view on the main screen. You can use the navigation arrows at the extreme left and right ends of this big picture to scroll between the pictures. Below the opened picture you will see three buttons, Download, Copy to Clipboard, and Share. Use any of the buttons to do the requisite. 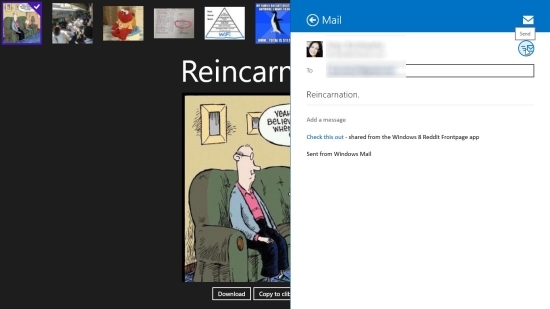 The pictures can be shared through your Outlook mail. This is how the app works. Before we make a final conclusion, lets have a quick look at the key features of this free Windows 8 Reddit Client app. Checkout some other free Windows 8 Reddit client apps we reviewed earlier: Reddit Filmstrip, Redditting. Reddit Pictures is a good app for Redditors who love to spend their time browsing and watching pictures on Reddit. Get this app and browse through a number of amazing, funny, beautiful Reddit pictures. Download them or have fun sharing with friends. Don’t forget to share your feedback via comments.